Sabre and Zeus pod drives make a great combination. Last year I wrote about the Sabre Yachts 40 Flybridge that I tested in San Diego, and what a kick in the pants it was to run such a responsive boat with pod drives and joystick control. Fast forward a year, and I found myself on the opposite coast in Ft. Lauderdale, Florida, testing her big sister: the Sabre 48 Salon Express. 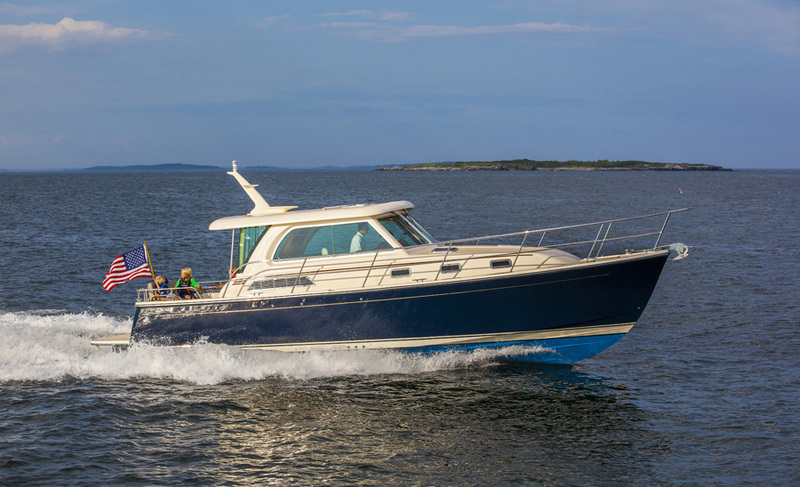 Although not a flybridge model, the 48, which also features Zeus pod drives, is no less fun to drive and adds a bit more space and comfort to the mix. Sabre’s vice president of sales and marketing, Bentley Collins, has not closed the door on possibly offering this boat as a flybridge in the future, but for now the 48 sports more traditional lines. The Sabre 48 Salon Express carries traditional lines - and it carries them well. Our test boat was the sixth hull of the Sabre 48, which has shown a steady rate of production of about one boat a month since the model’s introduction. The Sabre 48 is a traditional Down East design combined with high tech construction methods and pod drives—shafts and prop tunnels are not an option. The construction is dry-stack resin infusion: materials are loaded dry into the mold and then infused with resin. 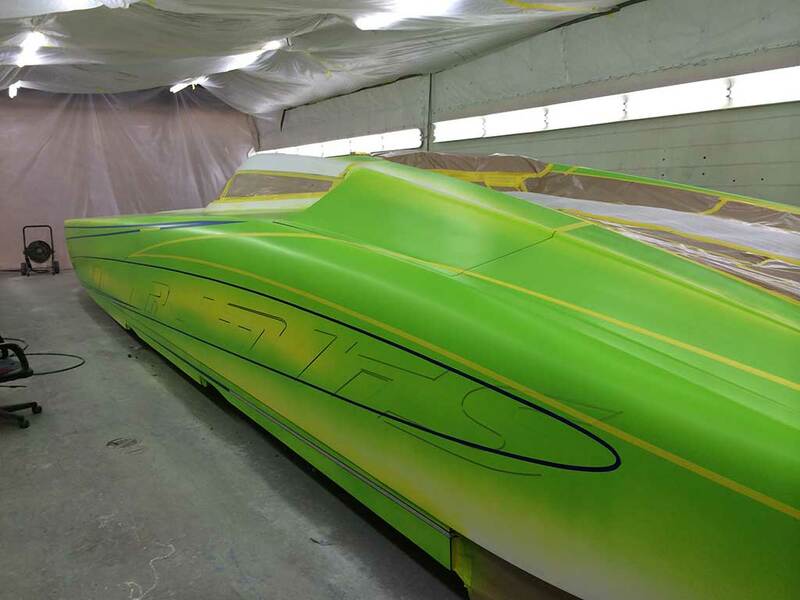 This process is cleaner, greener, and uses less resin, to make the boat lighter, faster and more fuel efficient. Like her little sister, the 48 has joystick control, this time with twin Cummins QSC8.3L 550 HP engines and CMD Zeus pod drives. The ease of maneuvering with the joystick, when combined with the Skyhook GPS dynamic positioning system, makes anyone feel like an expert at the helm. Larger engines (650 hp) are an option but apparently only add about a knot at the top end and hardly seem worth the expense. Initially, this boat was designated a 46 footer but it grew 18 inches once it was measured with the bustle that extends the running surface and increases buoyancy aft. The bustle was required due to the engine placement, which brought a significant amount of weight farther aft. This made the boat longer, and quieter inside. On top of that, it created nearly seven feet of extra space below the salon where an optional third cabin was added. 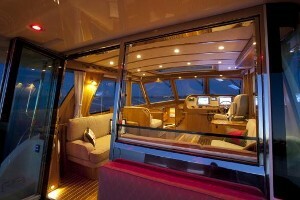 Large windows and a glass aft bulkhead bring plenty of natural light into the cabin. Boarding is easy via the swim-step that leads into the cockpit, where an L-shaped settee up against the transom faces an additional double seat with a table in-between. The decks leading forward are wide and clear with over-sized stainless-steel handrails, and there are good size chocks and mid-ship cleats. On the bow is an electric windlass and a double anchor roller, along with two large opening lockers. Anchoring should be easy with this amount of space in which to work. You enter the salon from the cockpit via a folding stainless-steel and glass door. 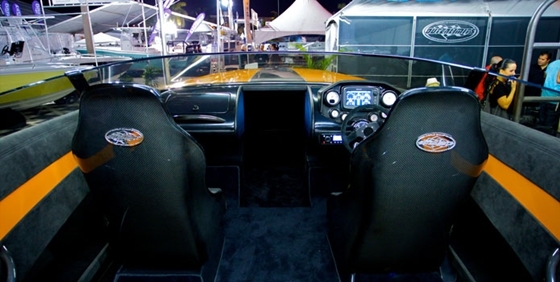 An electrically-operated window next to the door opens to join the interior with the exterior and connects the cockpit, salon, and helm, to give a feeling of one larger open living area. The exterior door next to the helm, however, felt a bit tight even though at 5’5” I’m well below the national unisex average size. The most notable feature inside is the unique “downstairs cabin” that is accessed when an electric switch slides the straight settee to port away from the wall, to reveal steps down to an area that’s highly customizable. This can be configured as a cabin for grandkids complete with a berth and TV, or you can add a stand-up head to create crew quarters. Some owners use this space purely for stowage and have added a workbench and washer/dryer. If you’re a bit claustrophobic, you can rest assured that you won’t get trapped down there even in case of a power failure or a malfunction, because there’s a manual override as well as an escape hatch through the salon sole. The salon has an L-shaped settee and a hi/lo table to starboard, plus a raised double seat across from the helm forward. Our test boat included dual Garmin 7215 multifunction displays, although owners are encouraged to work with dealers to specify their own electronics packages. Forward to port and five steps down is the galley. Although it is on a lower level, the cook won’t feel buried in the hull due to light from the large windshield above, which filters down and brightens the whole area. Standard galley equipment includes an electric two-burner stove, a microwave convection oven, stand-up refrigeration, and solid-surface counters. Shoji screen doors accent the cabin and galley. Like most Sabre Yachts models, the 48 liberally uses Shoji screens and accents to add richness to the interior. A Shoji screen door leads directly from the galley into the master, where there are more Shoji-accented lockers. The cabin door just clears the foot of the bed upon closing and from there it’s only three feet or so to the galley counter, so you’d better make sure your guests aren't early-risers who rummage around the galley first thing in the morning. An en-suite head includes a glass vessel sink, tiled floors and walls, and a large separate shower compartment. 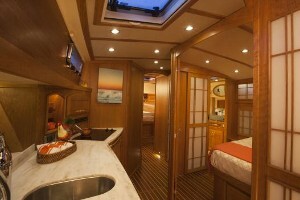 The guest cabin, also with Shoji screen doors, an island berth, and a head, is in the bow. Excellent joinery, a fine satin cherry finish, and subtle LED lighting create a calm and relaxing atmosphere throughout. 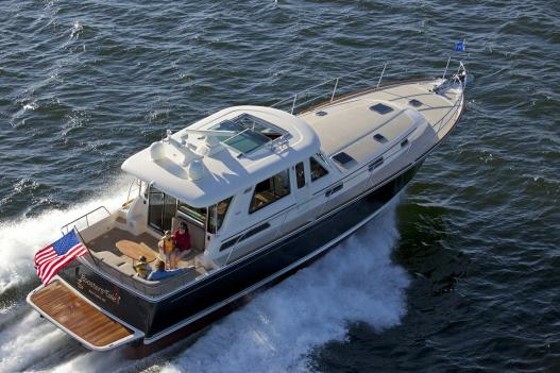 Though the interior is calm and relaxing, this boat’s performance is invigorating. The vectored thrust of pod drives is very efficient and higher speeds may be reached with less horsepower, and therefore less fuel. The engines on the 48 are close-coupled with the drive units so they are outside and away from the living space. Designer Kevin Burns was careful to ensure that weight distribution wasn't going to affect the running angle, which is just four degrees up from static attitude. The boat will plane at 14 to 15 knots and getting there is the only time the bow rises and obscures visibility forward. The Sabre 48 cruises at 27 knots and 2500 rpm, where it burns approximately 40 gallons per hour. Wide-open throttle will take the boat up to 34 knots, where fuel burn jumps to 60 gph. At five knots range is around 1,800 nautical miles, and at cruising speed, is in excess of 350 miles. As we tested the boat in open water off Ft. Lauderdale, the Sabre 48 took tight turns at high speeds and sliced through the waves like a race car. Even when we headed for the large wakes left behind by sportfishers, the boat cut through them without a hiccup. The weight of the dozen people aboard was a non-issue as we hummed along like a locomotive on a rail—I wanted to stay out all day. Our test boat was outfitted with a variety of optional gear including the Freedom dinghy lift on the swim step and the electric sunroof over the helm. 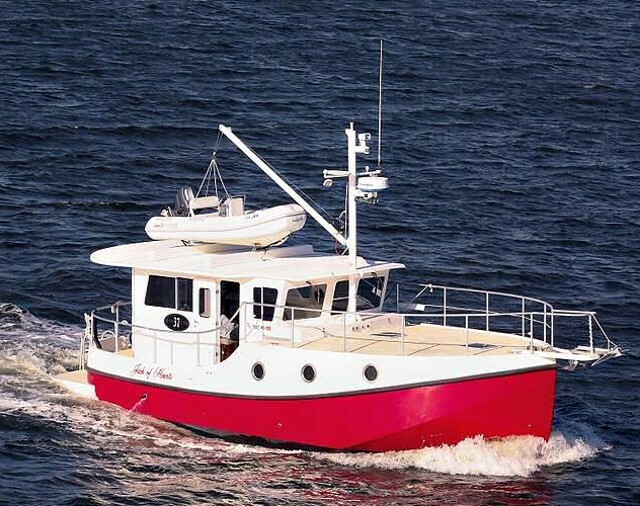 Other options include a fuel polishing and oil change system, custom hull and deck colors, teak decking in the aft cockpit, Ultraleather upholstery, a transom shower, underwater LED lights, and more. Although the Sabre 48 base price is $950,000, our decked-out test boat came in at about $1.2 million. 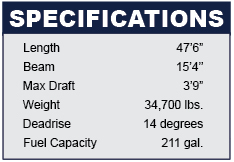 How do you pick what’s best about a boat that does so much so well? One thing that stands out about the Sabre 48 is how it takes care of itself and its owner, with the LaunchPad information system, an iPad-based tool that’s offered with every new Sabre. Buying a Sabre 48 may seem like an expensive way to get an iPad, but consider that it will help you run the boat better because it holds electronic versions of the system’s equipment manuals; apps that help find marinas, services, and weather information; and you can even report service issues by sending the factory or dealer a description of the problem along with an image or video. At resale, the new owner will also benefit from the comprehensive records and history. This is one of the smartest owner benefits in the industry—and much like the trademark Sabre tool kit, it’s included standard. The Sabre 48 Salon Express is a versatile boat fit for the cooler weather of the northeast or the Pacific northwest, but also tropical climes in Mexico or the Caribbean. It’s a posh platform that will get you where you’re going quickly and with relatively good fuel economy. And did I already mention how much fun pod-driven boats are? 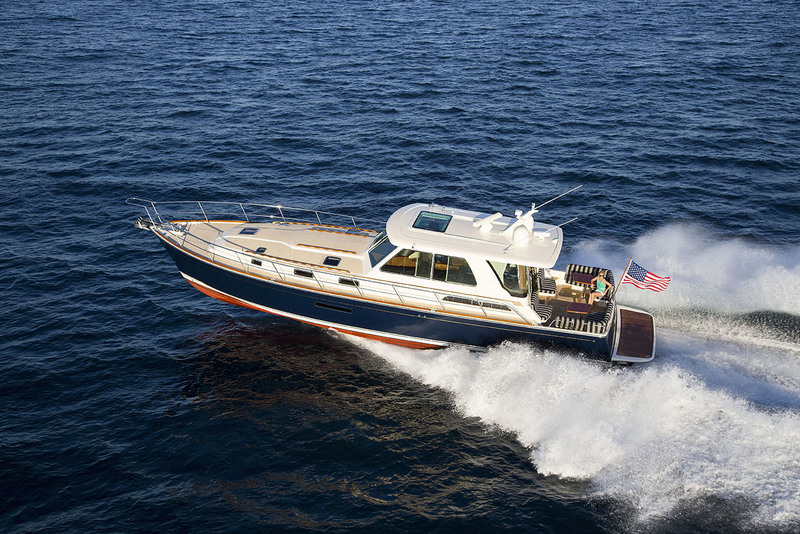 Other Choices: For Down East styling and a luxury experience, also see SanJuan Yachts’ 48 SJ. It’s not pod driven, however, and instead has twin MTU diesels with conventional props in tunnels. 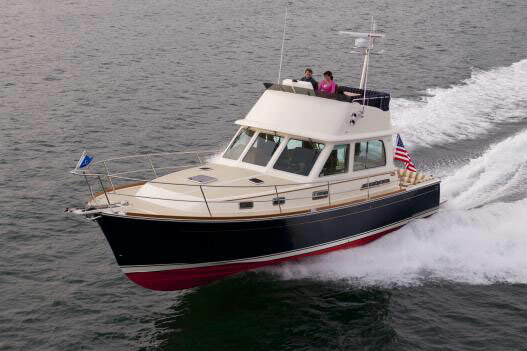 Hunt’s 44 Express Cruiser comes in both flavors, with a pair of Caterpiller ACERT inboards, or Volvo Penta IPS600 pod drives. For more information, visit Sabre Yachts.